In ''Interior Evening'' Charles Hardaker shows his fascination with light and shade and the sense of texture they can create. Hardaker started painting these internal scenes of his studio around 2002 and since then demand has been strong. Interest has been further developed with the showing of these paintings at Royal Academy Summer shows. One can see the influence of the early twentieth century Danish painter Vilhelm Hammershoi who painted many muted interiors. While Hammershoi''s work concentrated largely on form and light and shade Hardaker has added many personal and idiosyncratic details to his paintings. In these small vignettes Charles Hardaker employs objects from his studio to create a still-life ''set''. Here a small table with jugs and a mandolin hanging on the wall. 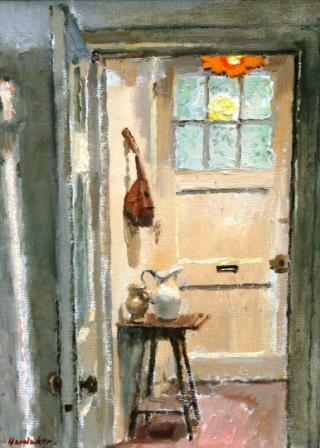 The door, open, allows warm evening light into the scene and creates interest in what else might be beyond. He sees the qualities of shape and form as transformed by light and shade in the most ordinary of objects. Charles Hardaker''s great skill is to treat each element with care and affection. Colour is a very important element in Charles Hardaker''s contemporary paintings. He uses a muted palette of neutral colours, which simplifies his work in the sense that light and form can be explored without distraction. There is a great feeling of stillness and calm in his art work.